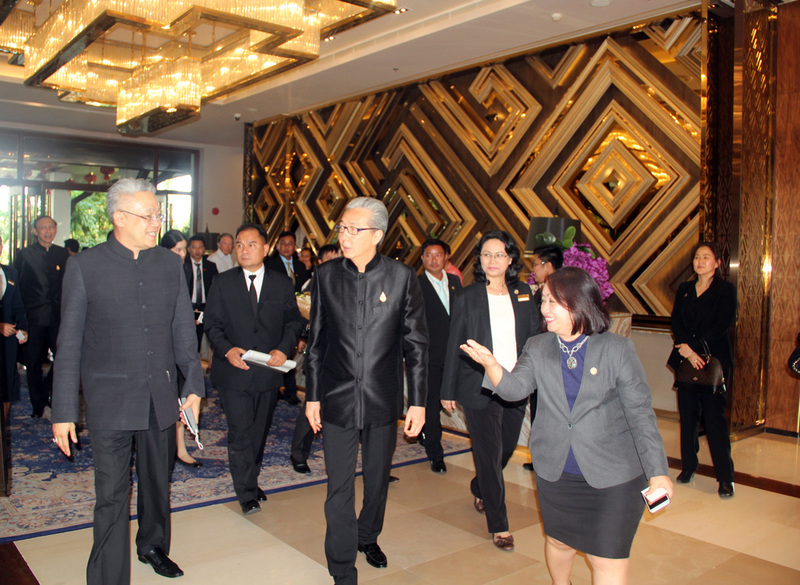 The Deputy Prime Minister of Thailand Dr. Somkid Jatusripitak and his delegation stayed at Chatrium Hotel Royal Lake Yangon during his state visit to Myanmar from 2nd Feb to 3rd Feb 2017. Mr. Chartsiri Sophonpanich, family member of Chatrium Hotels and Residences and President of Bangkok Bank, H.E. Mr. Pisanu Suvanajata, Ambassador of Thailand to Myanmar and Ms. May Myat Mon Win, General Manager of Chatrium Hotel Royal Lake Yangon and her team warmly welcomed the delegation upon their arrival. During his visit Dr. Jatusripitak attended a gala dinner at the Royal Thai Embassy in Yangon with Chatrium Royal Lake’s Food & Beverage team proudly catering to the event. Dr. Jatusripitak also attended the “Thailand Myanmar Business Cooperation” seminar held in the Chatrium Grand Ballroom, where he delivered the opening address. 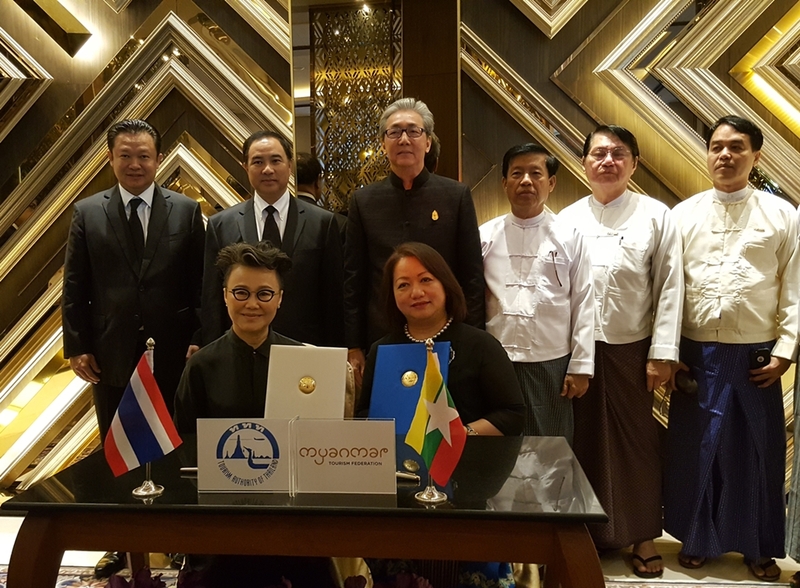 Following this, Dr. Jatusripitak presided over the signing ceremony of a Memorandum of Understanding between Myanmar Tourism Marketing and the Tourism Authority of Thailand in the Chatrium VIP lounge. Co-signed by Mrs. Srisuda Wanapinyosak, Deputy Governor for International Marketing (Asia & South Pacific) and Ms. May Myat Mon Win, Vice Chairman of the Myanmar Tourism Federation (Marketing Committee), the MOU is a joint marketing campaign to promote two-countries-one-destination through marketing activities at Chatrium Hotel Royal Lake Yangon and will be launched at International Tourism Borse (ITB), the world’s leading travel trade show, in Berlin, Germany from 8 – 12 March 2017. 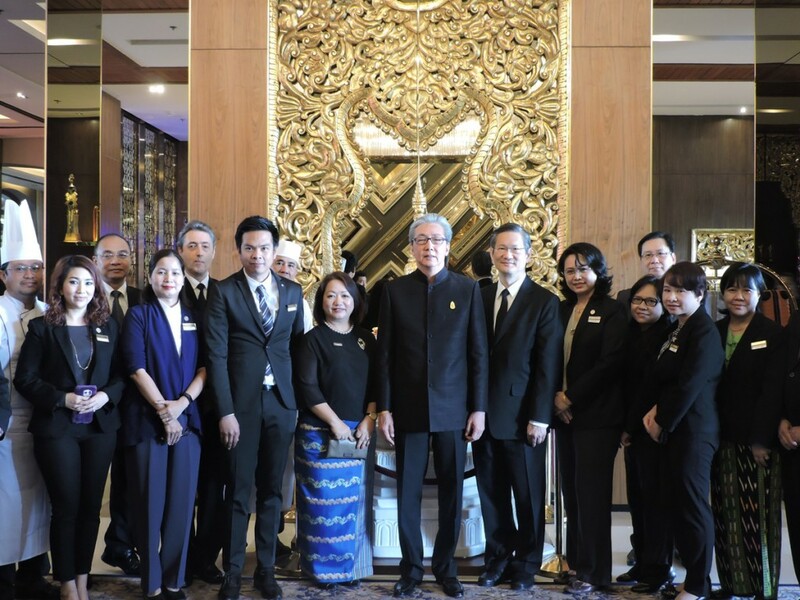 Before leaving Dr. Jatusripitak and Mr. Sophonpanich along with Ms. May Myat Mon Win and the hotel’s management team got together for a group photo session upon the Deputy Prime Minister’s departure. Chatrium Hotel Royal Lake Yangon was honored to provide remarkable hospitality for the Deputy Prime Minister and his delegation and hopes to have the proud opportunity to welcome them again soon. Chatrium Hotels & Residences was born from a passion to provide uncompromising, warm service and a truly captivating experience. Discover genuine five-star services, whether it be Chatrium for class-leading upper scale opulence or Maitria for contemporary luxury with all the essentials and more needed for a remarkable stay. Every Chatrium Hotel and Residence offers a charming personal touch at properties that promise sublime comfort, ultimate convenience and stunning surroundings. From cosmopolitan city center living in the heart of Bangkok to the relaxing beauty of Yangon and a breath-taking highland sanctuary and golf resort in Chanthaburi, Thailand, Chatrium Hotels & Residences is the instinctive choice for travelers seeking luxurious personalized service, a well-crafted experience and true destination authenticity where the brand promise of “Live the Remarkable” is much more than a mere promise but Chatrium’s very “raison d’être”.